A sign displayed in a garden of blossoming flowers with the backdrop of City Hall in the Queen Elizabeth II Court in the City of Regina, Saskatchewan. A sign promoting Regina, Saskatchewan and the admiration the local people have for their city is displayed in a garden in Queen Elizabeth II Court where vibrant red flowers blossom. Directly behind the sign, is a beautiful fountain where people can listen to the soothing trickle of the water under the blue sky. Towering 16 storeys high above Queen Elizabeth II Court, is the City Hall building. This building opened in December of 1976 making it the fourth one the City of Regina has called home to City Hall. City Hall building and fountain in Queen Elizabeth II Court, City of Regina, Saskatchewan, Canada. 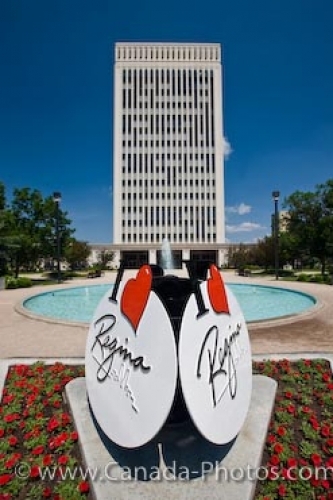 Picture of a sign, fountain and City Hall in Queen Elizabeth II Court in Regina, Saskatchewan.